※Click the image to open panorama image. 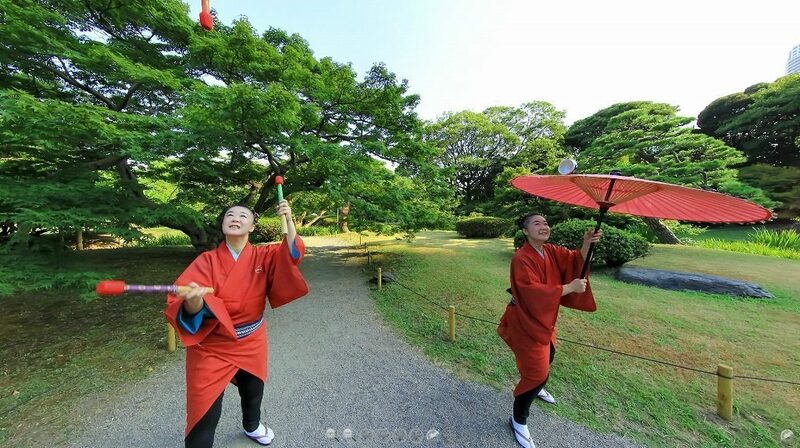 400 year history of Daikagura comes alive in front of your eyes! Kikusen’s energetic performance brings you full of excitement and laughter. Enjoy the traditional juggling tricks! What can you expect to spin on top of spinning umbrella? A ball, a tea cup, and more! The faster things spin, the luckier you get!? Tea cups built up higher and higher on the tiny board on the chin…. Exciting trick you can’t breath! This is performed as a part of Kabuki. Sticks are tossed and juggled in 48 ways! When Japanese fan meets a ball, they make an incredible entertainment! How does this happen? You will be fully surprised! How do you balance with a cup full of water on the long stick? And what’s going to happen at the end? Get Kleenex before you watch it! In ancient era, people wish great harvest on this performance. It looks easy to do, but you will be amazed by the show goes by… Have fun! Combination of Japanese traditional dance and juggling! All kinds of Japanese traditional dance. Kappore, Yakko-san, and Fukagawa. Kikusen shows what traditional Japanese dance is! The length and combination of the show can be arranged to your plan. English translation is available.